The $2.5 billion Mars Science Laboratory (MSL) rover is beginning detailed analysis of the first subsurface rock sample acquired on another planet, keeping researchers on "pins and needles" about whether Curiosity has struck Martian paydirt 216 million miles (348 million km) from Earth. Preliminary examination of the greenish, mudstone-like sample is peaking interest and debate about whether the flat rocks under Curiosity's wheels could be a type that perhaps preserved organic carbon relevant to potential past life on Mars, JPL geologist Robert C. Anderson told CuriousMars. A Curiosity CheMin image on Martian sand shows how new X-ray Diffraction data on subsurface rock sample will appear. Each mineral has a unique pattern of rings, or "fingerprint," revealing its presence. Credit: NASA/JPL-Caltech/Ames. But nobody will know the answer to that question until Curiosity completes its chemical and mineralogical analysis just getting underway with the CheMin and SAM instruments, said Anderson, a member of the MSL Surface Sampling System (SSS) team that weighs both science and engineering factors to advise the Science Team. The analysis is by far the most significant scientific investigation carried out by the rover since its landing last August. "Everybody is holding their breath to see what the sample is," he said. The first instrument to process a portion of the sample will be the NASA Ames Research Center's CheMin Chemistry and Mineralogy instrument, which will identify and measure the abundances of various minerals in the rock powder. "This stuff we drilled is new material to us," said David Blake, CheMin Principal Investigator. "We are all sitting on pins and needles about what it is," he told CuriousMars. Motion sequence for the drilling of the subsurface rock sample shows the 7.5 ft. robotic arm move the instrument turret into position for drilling underway as shadow moves to right, then turret rotates its Mars Hand Lens Imager for close-ups. Credit: NASA/JPL-Caltech. More than 100 members the MSL science and engineering teams have been meeting this week to review the mission's status at Caltech, the California Institute of Technology near the Jet Propulsion Laboratory in Pasadena, Calif. which controls the Curiosity and Opportunity rovers on opposite sides of Mars. The review could not have come at a better time. There are high stakes for the analysis of this first subsurface rock sample because the results could change the immediate course of Curiosity's mission as well as what we know about Mars. Three sources told CuriousMars that members of the Science Team debated openly at Caltech this week whether Curiosity's trip to Mt. Sharp (its original priority) should be delayed further if critical new chemistry and mineralogy data expected next week provides evidence the site could have been habitable to ancient microorganisms. The Los Alamos ChemCam laser was fired at the test hole talus to collect elemental chemistry data. Arrow mark burned spots in rock dust where the laser beam hit. Some scientists reasoned that if the new CheMin and SAM data show the drilling site is made up of water related minerals that could have helped preserve organic carbon - the building blocks for life - it would be worthwhile to stay and explore the Yellowknife Bay drilling area further. Others team members briefed their colleagues on specific science targets either enroute to or along the flanks of Mt. Sharp, that they want to get to soonest based on MSL and Mars Reconnaissance Orbiter imagery. These were viewed as markers laid down by those team members who will raise them again when the various options for the routes to Mt. Sharp are being boiled down into a formal plans, that are always subject to change. By determining the mineralogy of rocks and soils, CheMin will assess the involvement of water in their formation, deposition, or alteration. In addition the CheMin data will be important in the search for potential mineral biosignatures, energy sources for life or indicators of past habitable environments, Curiosity's prime objective. Rover Mastcam imaged the primary and mini test drill holes on Mars and the talus with a greenish gray tint. Credit: NASA/JPL-Caltech/MSSS. CheMin is mounted internally beside the NASA Goddard SAM Surface Analysis at Mars instrument that can detect organic carbon. SAM could receive its subsurface rock sample at the same time as CheMin, but then seal up its sample allotment within SAM to prevent the escape of any volatiles. But CheMin will most likely process first because it can not protect against evaporation of water related molecules important to its analysis. Also many scientists would like to know the CheMin results before the SAM analysis begins. A primary objective of Curiosity's mission has been to reach Mt. Sharp and to be well into the exploration of its lower canyons before the end of two Earth years, equating to one full Martian year. Already Curiosity will be cutting it close, although it is expected to survive more like six years unless it has an accident. But funding could get tougher in the years downstream. The rover is currently 9-10 months worth of driving away from Mt. Sharp, meaning the rover will be into its second Earth year on Mars with as little as 8 months left in its primary mission when it finally reaches the mountain. Once there Curiosity is likely to go up some dead-end canyons forcing some time consuming backtracking to fully analyze the lower layers of the 15,000 ft. mound that records perhaps 2 billion years of Mars history like no other place on the Red Planet. Mastcam shows potential drill locations and the final spot selected for the mini test and primary drilling on a feature called "John Klein" located in the Yellowknife Bay area of Gale Crater. Credit: NASA/JPL-Caltech/MSSS. Mission Scientist John Grotzinger of Caltech has often stressed that "the mission is 100% science driven". But he has also said he will "steal the rover keys" from his fellow scientists to make sure Curiosity hits the road to Mt. Sharp right after the drilling science analysis is complete. If the imminent analysis is as provocative as many scientists hope it will be, it will be interesting to see how "Grotz" weighs that situation. "There is no predetermined course," said Anderson. "I believe the Science Team wants to get to Mt. Sharp, but they also do not want to pass up anything that could be very important as we drive across the plains before getting to the mountain," he said. Drilling a hole into a Martian rock has taken years of development by JPL. 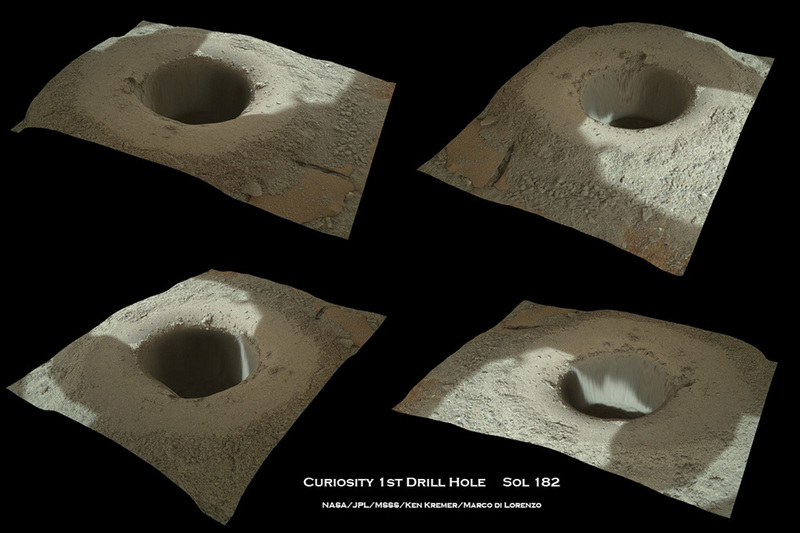 Curiosity first drilled a Martian "mini test" hole that was just 0.8 in. (2 cm) deep on February 6/Sol 180. Anderson and other SSS team members examined the tailings and were pleased to see the percussion drill had created extremely fine grained powder which it flung a few inches from the hole because the intent was not to collect a sample on this first exercise. Motion image shows the same area as in the picture above, both before and after the mini test hole was drilled. Credit: NASA/JPL-Caltech/MSSS. Geologists were immediately intrigued by the powder's greenish-gray color, not seen on Mars before or even hinted at on rocks heavily brushed by Curiosity, Opportunity or Spirit. With such favorable test results, Curiosity's engineers were cleared to unleash the rover's percussion rotating chisel to drill a hole to the maximum depth possible. That was done on February 8/Sol 182 when Curiosity created a 2.5 in. (6.4 cm.) deep 0.63 in. (1.6 cm.) hole in fine-grained sedimentary bedrock feeding the powder from the bottom of the hole up into the drill's storage can. "The most advanced planetary robot ever designed is now a fully operating analytical laboratory on Mars," said John Grunsfeld, NASA associate administrator for the agency's Science Mission Directorate. "This is the biggest accomplishment for the Curiosity team since the sky-crane landing last August and another proud day for America," he said. New Curiosity self portrait especially shows the alien terrain of Yellowknife Bay on Mars now 216 million mi. from Earth. Credit: NASA/JPL-Caltech/MSSS. Anderson said the forces on the drill for its Mars work were toward the lower range required to drill test rocks on Earth. This is another indication Curiosity may have bit into a relatively soft mudstone, a fine-grained sedimentary rock whose original constituents were clays or mud that formed in water. On Mars those constituents could also theoretically involve young basalts - bad news unless Martian organisms like hot lava and sulfurous gasses. The rock powder generated during drilling traveled up flutes on the bit into a container that collected plenty of powder for a number of transfers to the sample-handling mechanisms of the rover's "CHIMRA" Collection and Handling for In-Situ Martian Rock Analysis device. It is a torturous name and acronym for a remarkable piece of robotics and packaging. Graphic shows the complexity of the CHIMRA device on instrument turret used to robotically filter and flow soil along proper paths as the arm tilts the unit to align specific areas of the CHIMRA with the Martian gravity vector. Credit: NASA/JPL-Caltech. Inside the CHIMRA the powder was vibrated over a sieve that screened out any particles larger than six-thousandths of an inch (150 microns) across. Rover engineers were even able to command the device to mechanically open so the sieve and flow paths could be inspected during this process. Curiosity's impressive robotic arm motors and software played not only a pivotal role in drilling, but also in sample handing. It carried out numerous, highly programmed, motions with the 60 lb. instrument turret to use Martian gravity so the powdered sample would fall through small passageways to reach the sieve and eventually the sample scoop tucked up under the CHIMRA. The scoop will be lowered and imaged as early as today or February 15, by the rover's color Mastcam imaging system for a final assessment of its suitability for transfer to CheMin and possibly also SAM the same day. That transfer should happen February 16-18. Dave Blake has been perfecting the CheMin instrument at Ames for use on Mars for 22 years. He built the first prototype in 1991 and the one on Curiosity is the "CheMin 4 design". Geologists use ground based versions of his instrument for Earthly mineral identification in the field. "Over that period and once we got the CheMin 4 instrument prototype we literally analyzed thousands of terrestrial materials all over the world to get their signatures," Blake told CuriousMars. With that immense data base, Blake and his team should be able to accurately identify whatever mineral types exist on Mars using CheMin's X-ray Diffraction and X-ray Fluorescence capabilities. When the powder is poured by the arm into the instrument's funnel atop the rover deck it collects in a reservoir above a wheel with 32 transparent cells, 27 of which can be used and reused for samples. Five of the cells hold calibration standards for repeated use throughout the mission. Two different transparent materials make up the windows in the cells through which the X-rays are fired, because the different windows can bring out different X-ray Diffraction capabilities. "Typically we will get 3 hours of analysis per Martian night," said Blake. "We operate at night because the instrument is cooler at night and the CCD that detects the X-ray protons is cooled with a cryocooler lowering the instrument's temperature to -55 to -60 deg. F," (-48 to -51deg. C) he told CuriousMars. Typically tests are run on back-to-back nights, although sometimes a longer test series is needed. The powder from this first subsurface drilling will likely be run several times as the team learns more about its composition, but significant results should be available by next week. There are two samples cells mounted on either side of 32 tuning fork tips set around a rotating tray in the instrument. To conduct analysis, the tuning forks are vibrated at a specific rate that can be tuned by the CheMin science team. "The actual cell with material is about 8 mm in diameter with a thickness of 200 microns, about the width of a human hair. The cell is filled with loose material and contained between two transparent windows. The X-ray beam that does the analysis is only 70 mm in diameter shooting through the middle of the cell," Blake explained. Exploded diagram of CheMin illustrates how the X-ray Diffraction instrument is integrated. Credit: NASA/AMES. To get all the material past the tiny beam during the analysis period, the instrument must keep the material moving by vibrating it. The measurements also require that the X-ray beam illuminate the powdered crystals in random orientations to illuminate as many sides of the crystals as possible. Over the course of a 3 hour run. But Blake said there will be a change in the analysis of the subsurface rock powder compared with CheMin's initial run in October using sand dust. When CheMin was first activated for the sand sample the vibration level was set too high and some of the material bounced out of the sample cells. The first run with the powdered rock will vibrated at a lower rate, then increased based on how the material performs. The \$2.5 billion Mars Science Laboratory (MSL) rover is beginning detailed analysis of the first subsurface rock sample acquired on another planet, keeping researchers on \"pins and needles\" about whether Curiosity has struck Martian paydirt 216 million miles (348 million km) from Earth.